As it was a pretty dark and very misty morning decided not to go out. Although can be used as an excuse and we can find our gear with ease using GPS plotters the problem arises when you shoot back the creels in a busy area. It is impossible to see the other boats buoys in time so end up being foul on some one else’s gear. 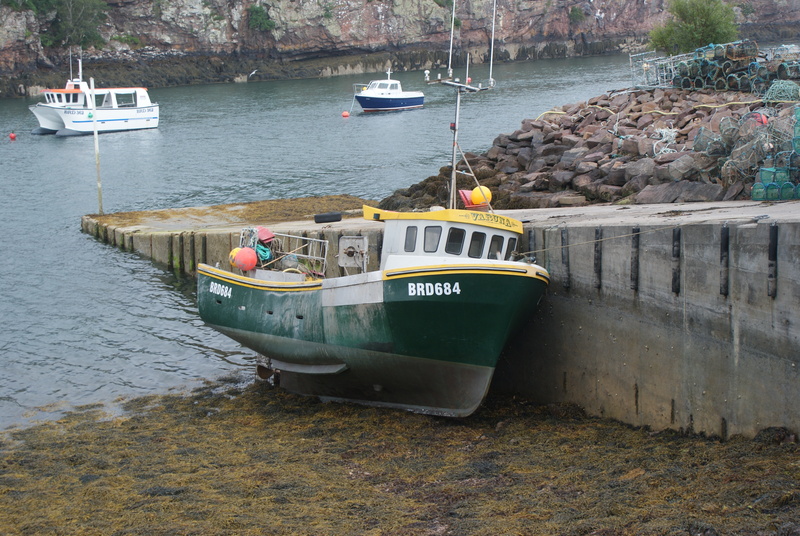 I had been putting off renewing some anodes and pressure washing the bottom of the boat so made that today’s job. I had a copper paint put on three years ago so I would not have to use anti fouling every year and this seems to work economically and also as I hate painting especially lying on my back underneath a boat. 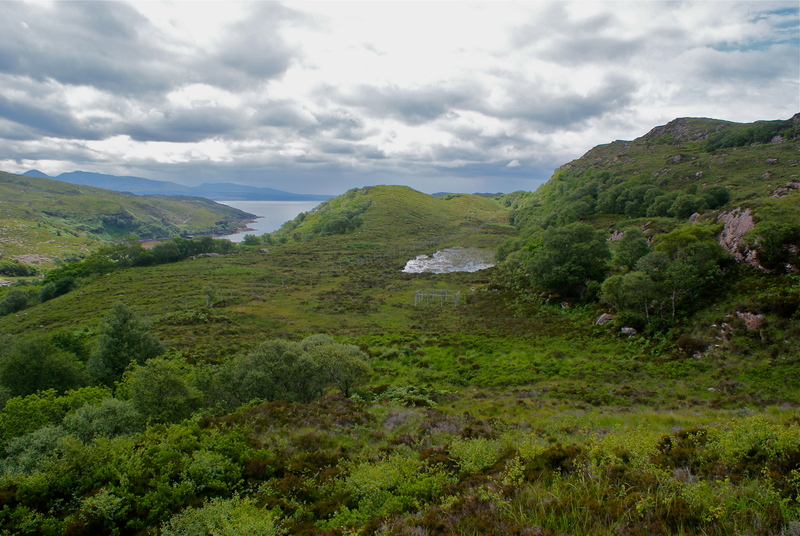 On monday I took Dougal and family down to the Toscaig Regeneration scheme on the Ardmor peninsula. This came about in the early 90s as a direct result of a European grant scheme I was involved with. At that time I was developing a scallop farm and included building a shore base and a new boat, taking on a full-time employee, casual labor and lots of debt. There was an environmental follow-up scheme which developed into fencing off 122 hectares of hill croft land with the intention of allowing trees to naturally regenerate. It is a beautiful part of the Applecross landscape but is fairly inaccessible as the ground is rough, a very peaceful place. As a committee we are relatively wealthy but lack the ability to take many decisions so the scheme remains in its basic state. Love the view looking over the old homestead. My grandfather’s house is the one with the red roof and blue porch. It is great that it is being lived in and not a holiday house, joining 50% of the houses in Applecross. Since moving up the road to the schoolhouse I have always wanted to do something with the croft but economics and time has always stepped in. I am now going to have it ploughed and resown with species rich grasslands. A return to the meadows of old. Even in the early 80s they still existed but as the crofting population has got older the grazing rules relaxed and sheep destroyed the old hay meadows. To the south the view out Loch Toscaig is spectacular. The little lochan has shrunk to half its size due to the spell of prolonged dry weather. Although the dogs put up a very healthy hind there does not appear to be too much damage to the regeneration. There are areas that are bursting with young birch and there are rowan and oak appearing as well. Over to the west it was another still day on the Crowlin Sound with a solitary sail boat heading north. Over a hundred years ago my family came over from the southeast of Harris and thought the Crowlins were a step up. They must have come from a material poverty unimaginable now.Eventually they came ashore and settled in Toscaig due to the generosity of the people at the time. As I remember this it is something I try to put in practice when people ,especially young , try to live in Applecross. It appears wrong that it is such a struggle for people to establish themselves here. There is only 65,000 acres to choose from , I suppose. Back in Harris things are now looking up with the North Harris Trust and also on the west side with the south looking to join in. School roles are growing and population demography is getting younger, houses are being built, not as investments but as homes. The investment is in the people. 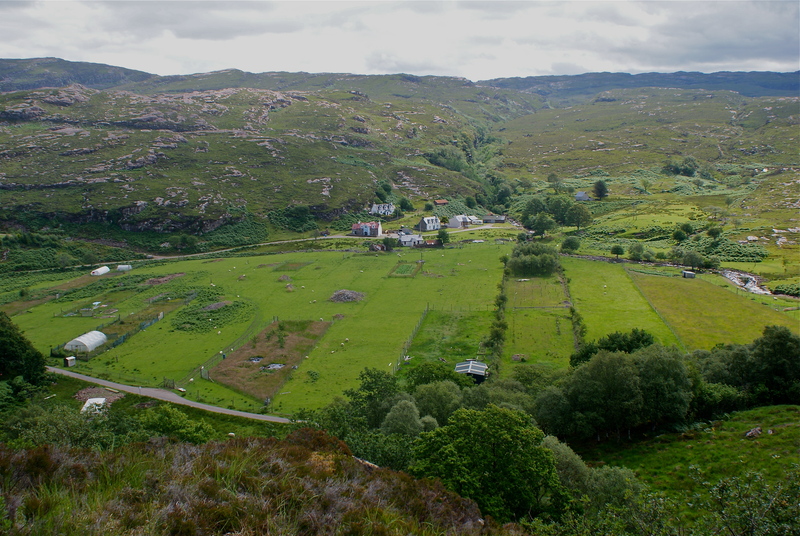 One of the obligations for the Toscaig crofters is to keep the fence in good order,a job that Dougal does not find onerous although on monday he did think it a little muggy. 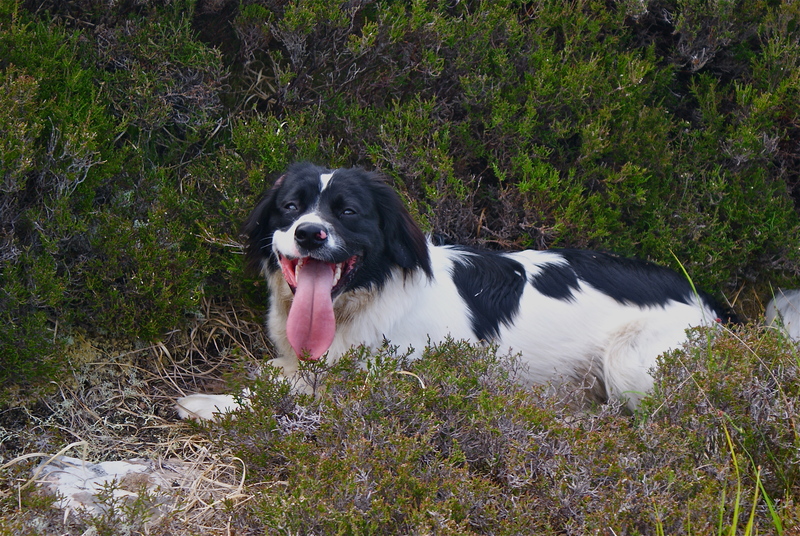 He does appear to have a big tongue. Back home after a couple of hours where as you have been out on the hill your senses are sharpened and I noticed the orange blossom tree was in full display. 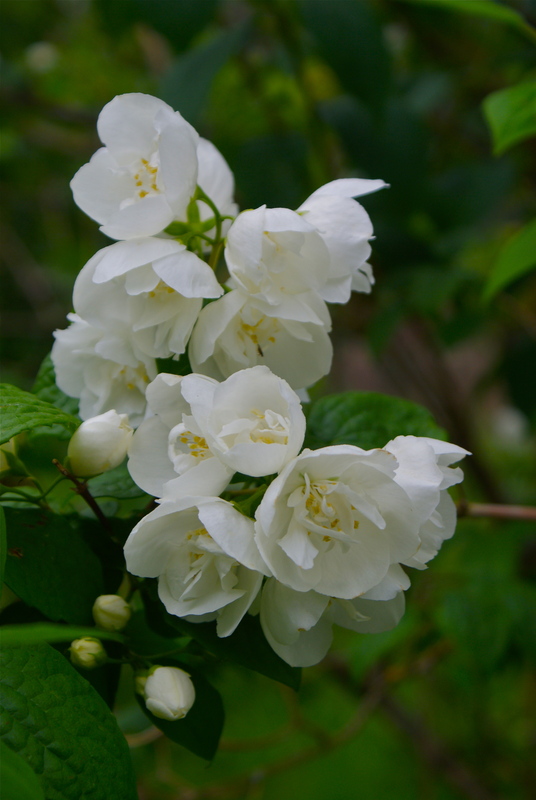 They do not last very long but when out they look and smell wonderful. Yesterday I went out a bit earlier than usual to catch the quiet morning before the afternoon northerly breeze got up. Even after 30 years of fishing from Applecross some days are beyond any description I am capable of. The sun was well up and there were a scattered array of clouds creating a moving tapestry of shadows across the land. 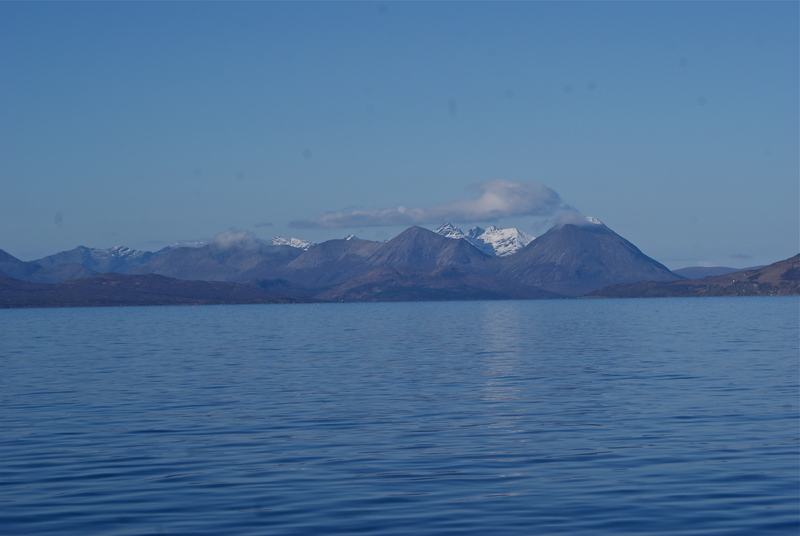 To the south-east you could see the Five Sisters of Kintail like an etching, to the south-west is the Red Cuillin and I cannot resist taking yet another photo. The dusting of snow still on her with the remains of the morning cloud above the clearing shadows are wonderful to watch. Then to the west you have the Island of Raaasay stretching up the Sound with its distinctive table top of Dun Caan in its middle. You can see the Harris hills through the Blind Sound. 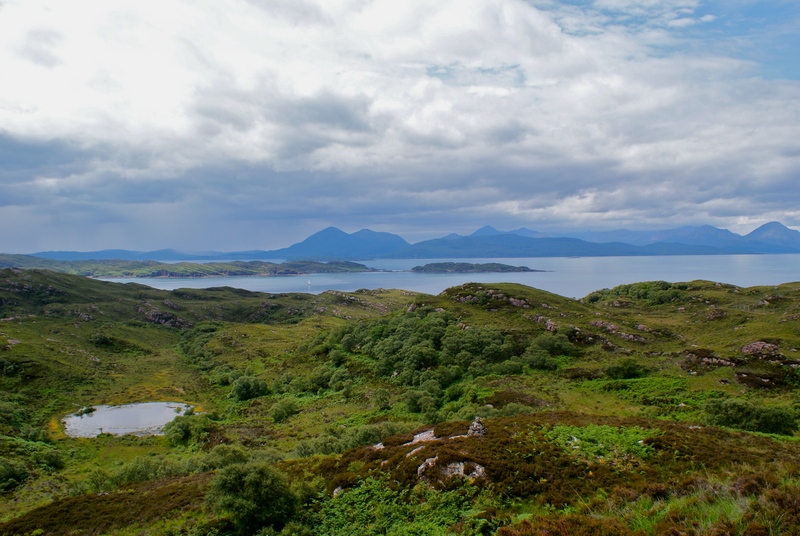 Off to the east its home dominated by the slightly foreboding or maybe protective Applecross hills. Perfection and a privilege to be here. Work is not the right word for what I do on days like this. It was a long day and 500 creels were hauled and although the fishing was poor it did not seem to be important. We take each fleet of creels ashore once a year to wash and do some repair work on them as well as sorting out some splicing that builds up over the year. 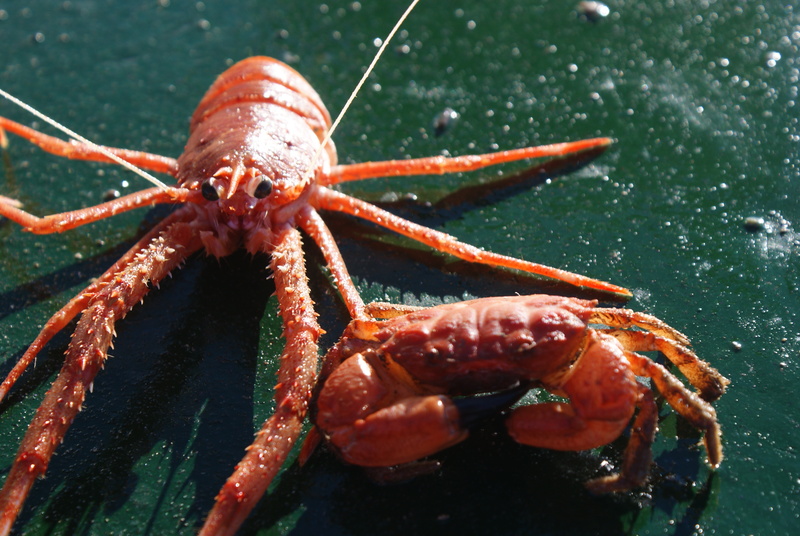 There is an interesting small crab that we seem to be catching more of recently. It never grows more than 2.5 centimetres. This is it beside a squat lobster and it looks as though it could handle itself. The evening shift at the Inn was a bit more relaxed with everyone enjoying the fantastic food. Judith took the evening off which is a good sign we are doing something right. 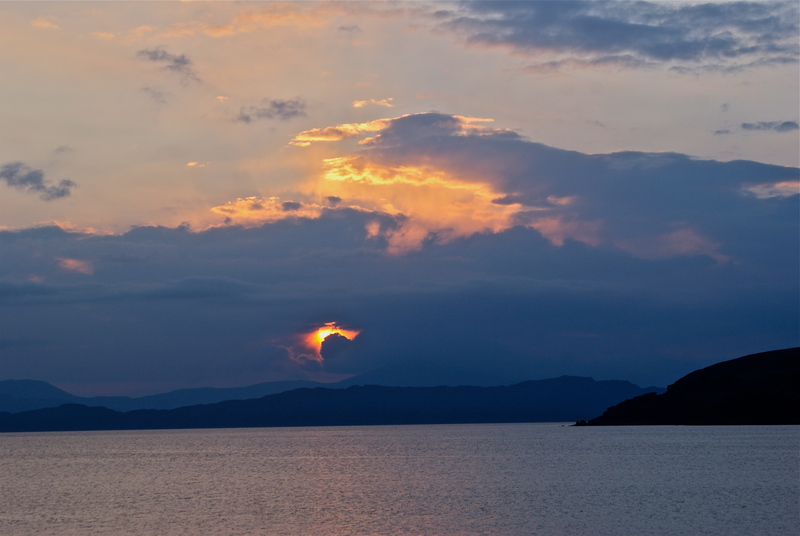 A beautiful sunset had people leaving their meals to take in yet another wonderful Applecross scene. After a day working on the pier sorting out my creels and trying to sort Dougal out it was back off to the Inn for another shift. These evenings are special to the people eating and staying at the Inn. There was a family from East Lothian who could not say enough about their evening’ experience and to be quite honest I was probably enjoying it as much as they were . They tucked into some large prawns I had taken ashore two hours before they ate them. It gives me so much pleasure seeing people enjoying themselves so much and it reminds me of being told once that if we honour and respect our food then it means so much more to us. The evening finished with another spectacular light show. I dislike intensely that corruption of the english language, “shock and awe” and awesome is over used so much these days but this scene looking across the Sound from the Inn does instil in me a real sense of awe. On the way home the local network alerted me to the possibility that there was a delivery of worms waiting at the shop. Dai the Post is too wary of Dougal and family’s intentions when he has tried to deliver mail in the past so we pick ours up and sure enough the worms were there so that is tomorrow’s job along with another 500 creels. What a life.